Breathing New Life Into Hank Williams' Lyrics The Lost Notebooks of Hank Williams features a number of major country and rock musicians, who craft songs around lyrics that Hank Williams left behind in four notebooks when he died in 1953. Bob Dylan, Alan Jackson, Jack White and Norah Jones are among the artists on the album. 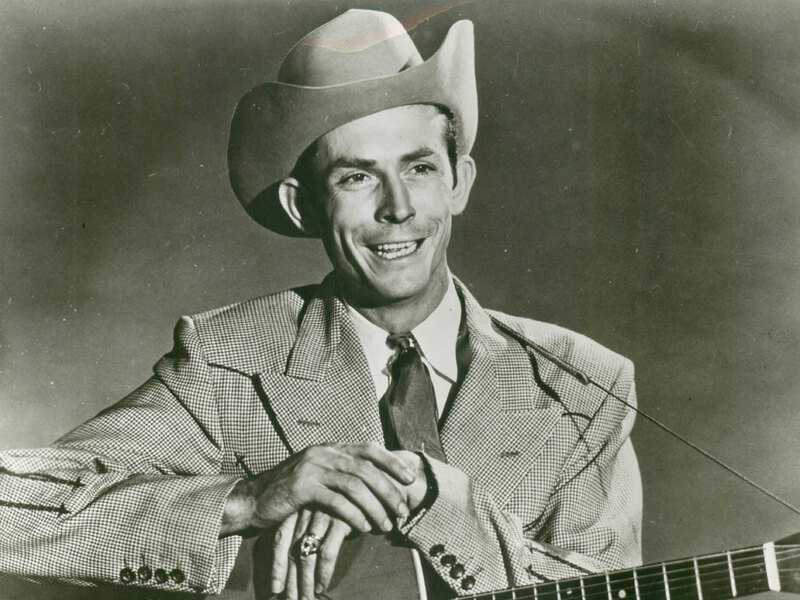 Hank Williams' hits include "Your Cheatin' Heart" and "Hey Good Lookin'." It's hard not to feel ambivalent about The Lost Notebooks of Hank Williams. Yes, it does give us an opportunity to hear previously unreleased lyrics by one of the greatest songwriters country music has produced. But Williams didn't write the music that accompanies his words, and as sincere as these performers are, none of the words are framed the way Williams would have, had he completed the songwriting process. Would Hank, for example, have set "The Love That Faded" to a waltz beat, as Bob Dylan has done with it? I like Dylan's performance, the way I like so many of his latter-day, gargling-with-Drano vocal turns. Dylan doesn't try to capture the sound of Hank Williams, and that's a good strategy. But so is Alan Jackson's, in "You've Been Lonesome Too," and if anything, Jackson sounds like an uncannily well-rested, well-preserved version of Hank Williams himself. One of the greatest gifts of this project is to hear Williams at his most heartless, bitter and vengeful. The legend spent much of his career balancing songs of heartache with songs of faith. But I was thrilled to hear the dark Hank Williams presented by Vince Gill and Rodney Crowell in their stark version of a great, ruthless lyric, "I Hope You Shed a Million Tears." Instead of heartache, heartlessness — dismissals don't get much more decisive than that. Dylan was the first artist contacted to interpret this material, and the album has been released on his Egyptian Records imprint for Columbia Records. The stone-cold words in "I Hope You Shed a Million Tears" can't help but remind me of the harsh Dylan of "Like a Rolling Stone" or something from Blood on the Tracks. Similarly, Patty Loveless takes another face-slap lyric, "You're Through Fooling Me," and brings it to full crimson passion and beauty. It's interesting to see the words of one song as printed on the CD jacket of The Lost Notebooks, and to listen to where the line-breaks occur in the singing of the others. Williams usually wrote here in quatrains, each verse a direct ABAB rhyme scheme. Keeping the structure simple allowed him to speak directly yet artfully. There's a flaw in this collection, however. Too frequently, the invited stars err on the side of caution, applying pallid, even rudimentary melodies to the lyrics, resulting in the washed-out backgrounds of songs covered by, for example, Sheryl Crow, Lucinda Williams and Jakob Dylan. Then there's Jack White's labored impersonation of the wrong Hank — he sounds more like Hank Williams III, the wobbliest member of the Williams family to trade on the great man's name. Overall, however, The Lost Notebooks of Hank Williams is catnip for anyone familiar with Williams' greatest hits. A couple of these songs could have been crafted by the man himself into important additions to his canon. As it stands, we have these reverent, and sometimes inspired, interpretations of words that ring with graceful candor.